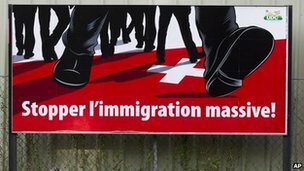 The Swiss government is to limit immigration from all EU states from May for a period of one year, in a move criticised by Brussels. Immigration caps on eight central and eastern states will be extended to 17 other EU states. Bulgarian and Romanian migration is curbed separately. Though not an EU member itself, Switzerland signed up to the bloc's rules on freedom of movement. Brussels criticised the decision to impose the new new quotas. There is concern in Switzerland about a growing influx of workers from poorer EU members. When it signed up to the freedom of movement rules in 1999, the country claimed the right enact a "safeguard clause" if the annual influx of workers from countries exceeded a certain number. From mid-2014 the clause becomes invalid, so the quotas can in theory only last for 12 months but Switzerland is due to hold two referendums aimed at limiting immigration. The limits on the eight newer EU member states were first introduced last year. From 1 May, the number of long-term residence permits granted to immigrants from those countries will be capped at at total of 2,180 for 12 months. The states concerned are Estonia, Hungary, Lithuania, Latvia, Poland, Slovakia, Slovenia and the Czech Republic. From the same date, long-term residence permits for the 17 older EU states will be capped at 53,700 for 12 months. Immigration to Switzerland from Bulgaria and Romania - the two newest EU states - is severely restricted, and may remain so for years to come. In a statement from her office, EU foreign policy chief Catherine Ashton said the new quotas disregarded "the great benefits that the free movement of persons brings to the citizens of both Switzerland and the EU". The vast majority of immigrants to Switzerland come from traditional EU members like Germany, Spain, Portugal and Italy, the BBC's Imogen Foulkes reports from Berne. It is thought that Portuguese seeking work will be hardest hit, she adds. The Swiss government has come under pressure from both the right-wing People's Party, and the Green Liberal Party, which say immigration has reached unsustainable levels, our correspondent says. Switzerland has low unemployment, high salaries, and a safe currency. A government statement said the number of people arriving in Switzerland had exceeded the number leaving by up to 80,000 in recent years. Limiting work permits "can help to make immigration more acceptable to society", the statement added. "Immigration" of non-europeans is an invasion! It will lead to White Genocide!